Manchester United visit the Emirates on Friday to play Arsenal in the fourth round of the FA Cup. Ole Gunnar Solskjaer’s men will head into the game full of confidence after recording their seventh straight win on Saturday, beating Brighton and Hove Albion 2-1. The Norwegian indicated following the game that Alexis Sanchez, who has struggled with injuries this season, could start the game against his former club. 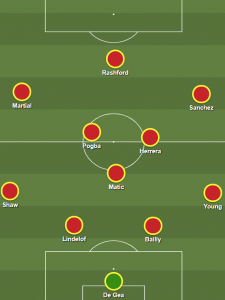 With that in mind, here is how Man United could line-up for their meeting with the Gunners on Fridat night. Sanchez has endured a difficult time at United even with Jose Mourinho gone, as niggling injuries continue to stymie his progression at a time when others are having the time of their lives under Solskjaer. Perhaps this weekend’s big occasion provides the perfect stimulus for Sanchez to propel himself back into the limelight. The Emirates under the lights. The BBC‘s blockbuster footballing event of the weekend. His former club. United full of confidence. A tantalising contest in general. Sometimes it takes occasions like these to truly get players like Sanchez back to their best. There would be no better club against whom to make a statement to the watching world, which has started to write Sanchez off.